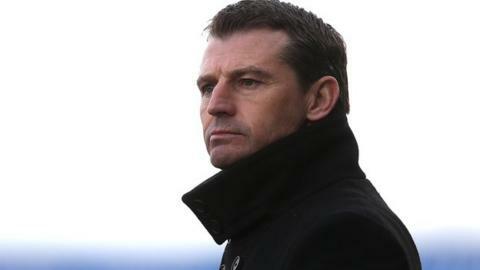 Hartlepool United manager Colin Cooper insists there was too much quality within his squad for them to be relegated from League Two this season. Monday's 2-1 win against Morecambe put them 10 points clear of bottom club Torquay with two games remaining. And they have a five-point cushion over Bristol Rovers and Wycombe, who face each other on Saturday. Cooper told BBC Tees: "We believe with what we have in the dressing room we shouldn't be in this situation." Jack Compton and Jack Barmby were 10-man Hartlepool's scorers against the Shrimps. "Maybe it was the perfect scenario for both Jacks," Cooper added. "I said to them both as they went onto the pitch, it's your opportunity to become a hero, and both came up with the goods. "Jack Compton has looked bright and brought that onto the pitch, while Jack Barmby has very good ability. "I spoke to him after the Portsmouth game when he took a heavy knock on his ankle and he wasn't effective. "Against Morecambe, Barmby played with no fear, came on to express himself and came up with an unbelievable finish to win us the game."